Does your church have momentum? Can you quantify it? Do you understand how to gain it? What can your team do to sustain and direct the momentum you have? Momentum is critical for leaders to steward and leverage. 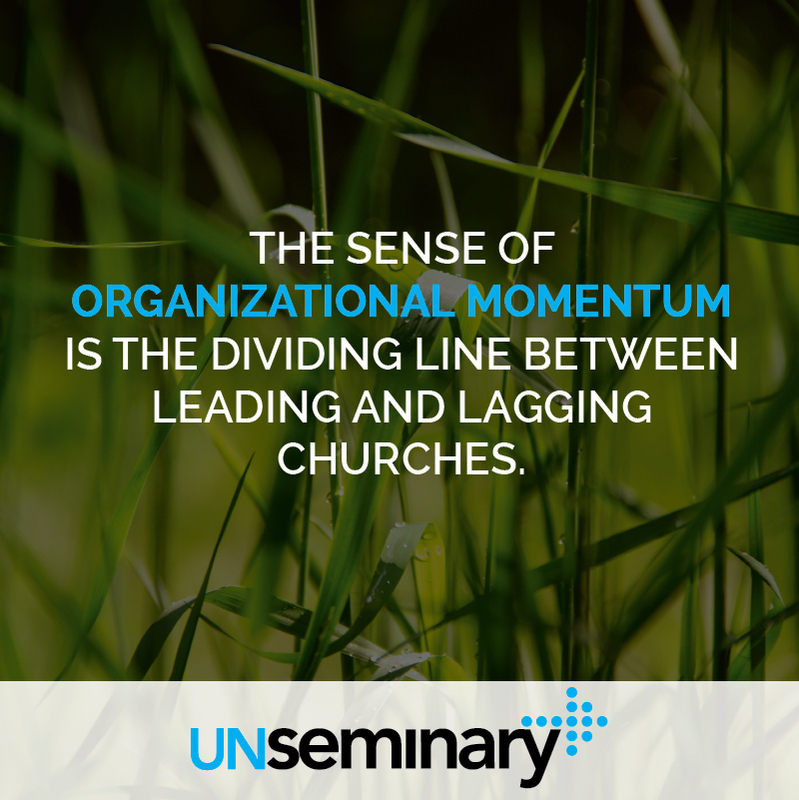 In fact, in my years of studying thriving churches, it is the sense of organizational momentum that is the dividing line between leading and lagging churches. Some leaders speak of momentum as a mystical or magical quality that can’t be understood, developed or deployed. Nothing could be further from the truth. You can see how it’s working in other churches and apply those lessons in your church. Lagging churches think a few “big days” every year will help their church grow. Leading churches consistently give people tools, inspiration and opportunities to invite their friends to church. Waning churches beg people to help make up a financial shortfall in the last quarter. Outstanding churches work to encourage a generous culture throughout the entire year. Struggling churches wait for a “big ask” from the pulpit to fill volunteer needs. Thriving churches have volunteer cultures with “easy on-ramps” all the time. Declining churches always need to look externally to find leaders when an opening arises. Prevailing churches work to infuse leadership development as a core part of everyone’s role within the community. Churches of impact consistently and regularly ask how they can improve what they are doing, while stuck churches rarely have cultures where it’s okay to point out where things could be better. 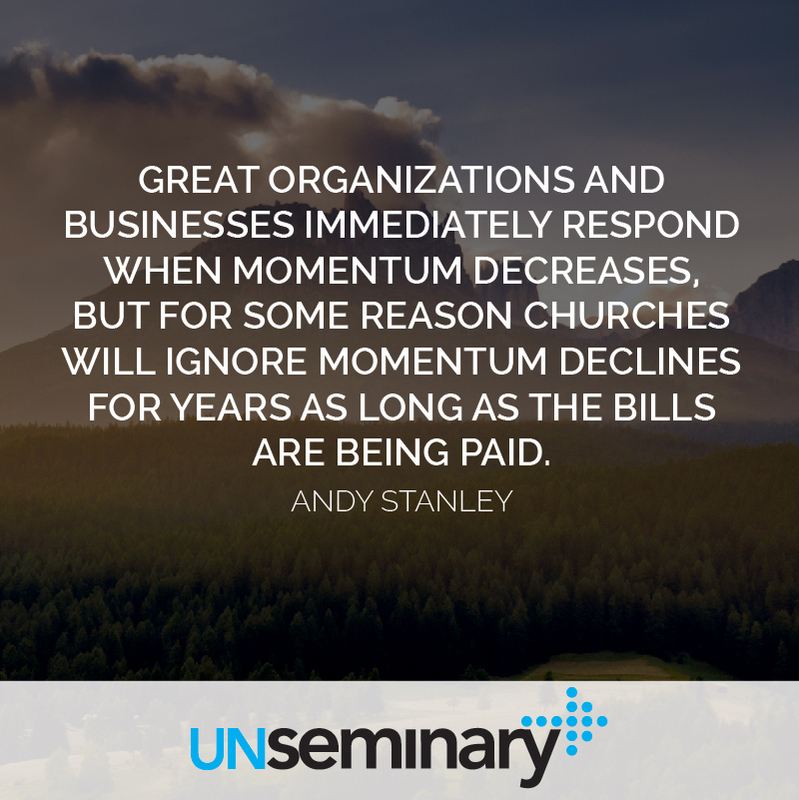 Great organizations and businesses immediately respond when momentum decreases, but for some reason churches will ignore momentum declines for years as long as the bills are being paid. Momentum is gained and sustained through consistent and building “wins” in a wide variety of areas in your church. Simply put: momentum is positive, focused energy in a single direction over time. Although momentum can be spurred through a single action, it takes repeated effort and energy in that area to gain true organizational momentum. The Merry-Go-Round // When I was a kid, there was one of those merry-go-rounds at our local park. It was always a fun part of playing at the park, largely because it was best done with a few friends. When you first sat on it, you needed everyone to push together in the same direction and it felt like that first turn would never happen. After the first time around, it would be easier but not by much, and you needed to keep pushing. As you continued to push, something happened with each successive turn … things got a little easier. At some point, the ride turned from being work to being fun … and you literally had to hold on for dear life, laugh with your friends and enjoy the ride. The same is true with momentum in your church. It takes a group of people agreeing on the same direction to push and work toward it over an extended period of time. It’s difficult at first and the tipping point between where it’s hard and where it’s fun is difficult to discern because you need to keep pushing. If you want to see momentum in your church, you need to agree and align on where you are going and then push together in that direction. It doesn’t happen overnight and it is a lot of work. But stick with it and at some point you may just have to hold on and enjoy the ride. Bigger and Better // In my freshman year of high school, our church youth group did an event where we were divided into teams and every group was given a single paper clip. Our instructions were to go up to a house and ask whoever answered the door to trade something “bigger or better” for the paper clip. We’d take each new item that we received and go to another house to look for something better. The team that came back with the “biggest” or “best” item after two hours won. Beyond this being an incredibly annoying thing to inflict on the neighbors around the church, it taught a simple lesson about momentum. When you keep pushing in the same direction and investing in the same strategy, you get inconsistently positive results that drive toward your bigger goal. The group that won traded the paper clip for a pen … and the pen for a notebook … and the notebook for a lamp … and so on until they ended up with a huge couch. They turned a paper clip into a couch just by asking people to trade them. They focused on picking houses wisely and working on their pitch to yield better results. The same is true of momentum in your church: it’s not only about pushing in the same direction but also staying tenacious and learning from every interaction to see better results. Stay at it … learn … keep moving forward. Momentum is forward motion fueled by a series of wins. 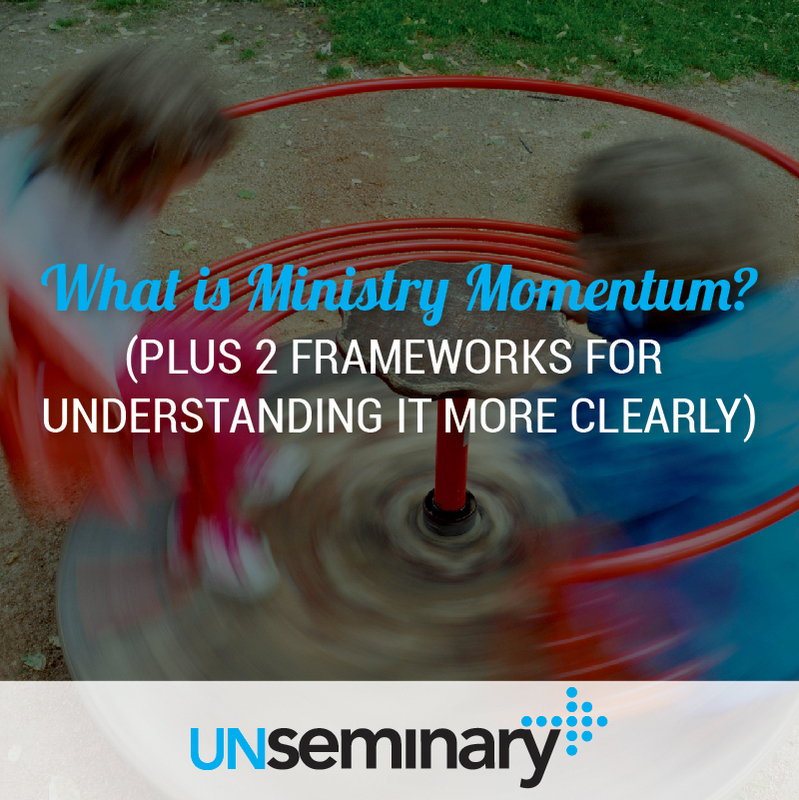 This year at unSeminary, we’re focusing on momentum. We want to help your church gain and sustain momentum in a wide variety of areas. We want to help you understand momentum better and to take steps toward building it in your church. Every day for five days, we’re going to deliver bite-sized video content and accompanying worksheets that will help you identify areas of momentum for your church. Each day we’ll give you a different area to focus on and content from multiple church leaders. There will also be a private Facebook group in which to discuss what you’re learning and get ideas from other church leaders. Cost: FREE. Click here to register now.